FOREX TRADING GUIDE: WHAT IS SEASONALITY ANALYSIS IN CURRENCY MARKET? WHAT IS SEASONALITY ANALYSIS IN CURRENCY MARKET? yourFXguide-We observed the seasonal behaviour of nature in our daily life. 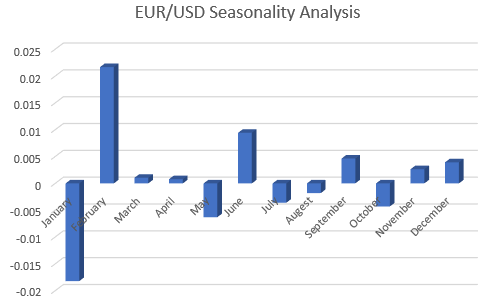 Seasonality analysis of currency markets involves the seasonal behaviour of currency pairs. In a currency trading book written by Kathy Lien, I was first introduced with this wing of technical analysis. I consider seasonality analysis of currency market as a dimension of technical analysis because the analysis is conducted on the historical data. Along this post, we will learn the way to conduct seasonality analysis of currency market. I gathered 26 years of data to conduct this seasonality analysis of some highly traded currency pairs. In the above illustration, the seasonal behaviour of EUR/USD currency pair is presented. From the chart, we can see the average bullish and bearish movement of the pair in last 26 years. From this analysis we can say there is higher probability of EUR/USD currency pair to be bullish in February and to be bearish in January. 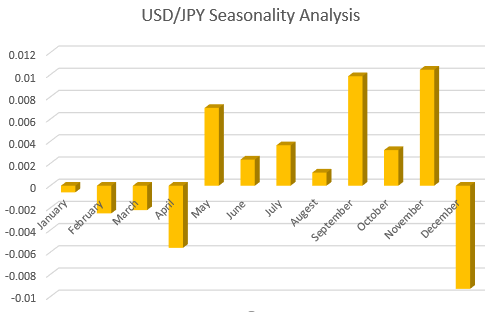 Our second currency pair is USD/JPY to be pulled on the seasonality analysis table. From the above illustration, we find that from December to April the currency pair is expected to be bearish, and from May to November the pair is expected to be bullish. 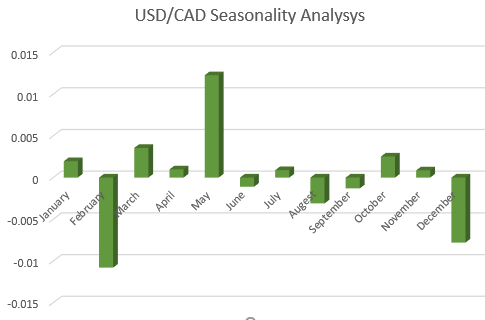 The seasonality analysis illustrated above shows that USD/CAD currency pair is most likely to be bearish in month of February and December, and the pair is most likely to be bullish in month of May. 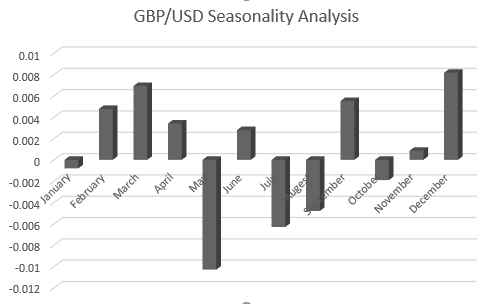 The seasonal behaviour of GBP/USD currency pair is illustrated above, where we can see that the pair is highly expected to be bearish in the month of May and bullish in the month of December. 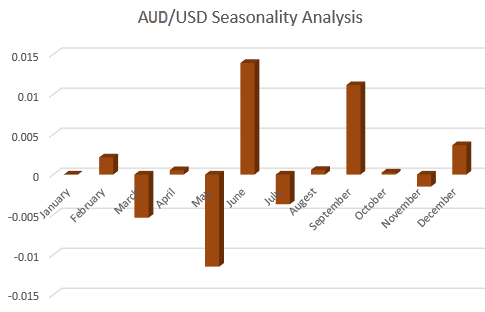 The seasonality analysis of the AUD/USD currency pair shows that in May the pair is highly expected to be bearish, and in June the pair is highly expected to be bullish. Seasonality analysis of currency market is not a short cut way to find the movement of the currency pairs rather it is a way to determine the probability of movement of a currency pair to a certain direction in a given month.